Dr. Shiv O. Prasher is a professor in the Department of Bioresource Engineering on the Macdonald Campus of McGill University. He has been a member of the McGill teaching staff since 1983. 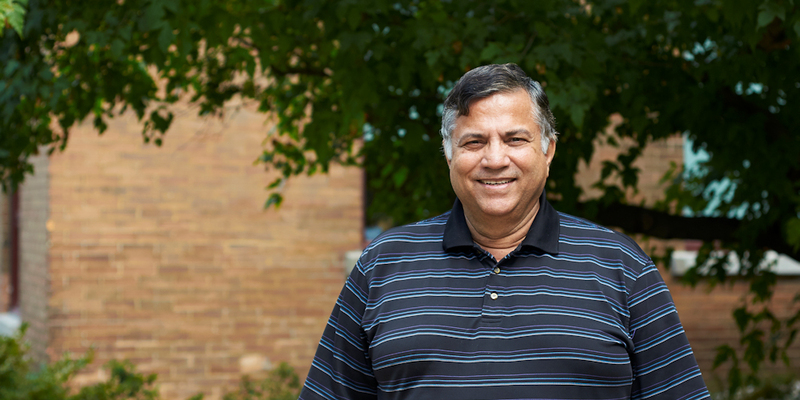 Dr. Prasher teaches both undergraduate and graduate courses and carries out research and extension in the area of soil and water engineering. He has published 242 research papers in refereed journals and over 60 papers in refereed conference proceedings. In addition, he has presented over 160 technical full-length papers at various scientific and technical conferences around the world. Dr. Prasher has been a member of the Canadian Society for Bioengineering (CSBE) and the American Society of Agricultural and Biological Engineers (ASABE) since 1978. He was the President of CSBE in 2010-2011 and, in that capacity, also served on the ASABE Board of Governors. He is an elected Fellow of CSBE and the Indian Society of Agricultural Engineers (ISAE). Dr. Prasher completed his undergraduate studies as well as his Masters degree in Agricultural Engineering at the Punjab Agricultural University, Punjab, India. He received his PhD at the University of British Colombia, Vancouver, Canada, in Interdisciplinary Studies. He also received an Honorary Doctorate from Dalhousie University in 2004 at the Nova Scotia Agricultural College in Truro, Canada. In 2016, CSBE/SCGAB awarded him the Maple Leaf Award. This award is given to honour members of the CSBE/SCGAB who have distinguished themselves as leaders in the profession. It is the highest award made by the Society in recognition of leadership in the profession. The award is given for outstanding personal qualities, society activities, and professional abilities. Dr. Prasher’s research program has been addressing the crucial challenge of sustaining agricultural production while protecting the environment from agricultural sources of contamination. The main innovative features of his research program are the incorporation of novel, conceptual, and innovative computer modeling, data analysis and processing techniques into problems of water resources management and water pollution. These skills will be needed in global systems of the future and my research program permits not only their exploration and development but also effective graduate training in these areas. Dr. Prasher has established a very strong research program in both bioenvironmental and soil and water engineering. A well-equipped laboratory for analyzing emerging contaminants, such as hormones and veterinary antibiotics, as well as pesticide residues in soil and water samples and a field lysimeter site have been complementing his research efforts and the training of graduate students in these areas. The focus of his research program is on the development of best/beneficial on-farm pollution control practices, hydrologic modeling of subsurface-drained agricultural watersheds under changing climate, fate and transport of emerging contaminants such as hormones and veterinary antibiotics, pesticide modeling, and use of artificial intelligence in soil hydrology. A US patent was awarded on February 22, 2000 on the development of an innovative bio-remediation system for contaminated soils. Bioresource Engineering: A user-level computer programming course. Fundamentals of how electronic computers and computer systems work, a disciplined general approach to the solution of engineering problems, and the implementation of these solutions using structured programming methods in a current computational environment. Bioresource Engineering: Stress, strain, resilience, elastic and plastic properties of materials; bending moment and shear force diagrams; bending and shear stress; deflections; simple, fixed and continuous beams, torsion and helical springs, reinforced concrete beams; columns, bending and direct stress; general case of plane stress; Mohr's circle.